As Nigerian women bobsled team prepare to make history at the 2018 Winter Olympic Games in Pyeongchang, South Korea, Nigeria Bobsled and Skeleton Federation president, Solomon Ogba stated that the sport will attract more Nigerians from home and abroad. Ogba was speaking during an event organised by Travelstart Nigeria and KLM Royal Dutch Airlines to wish the team well at the Games billed for February 9-25 in the Korean resort City. The Nigerian team made up of Seun Adigun, Ngozi Onwumere, Simidele Adeagbo and Akuoma Omeoga will make history as the first African women team to participate in the Games. Ogba, a former Athletics Federation of Nigeria president, submitted that their participation, win or lose, will open doors for more Nigerians to participate in the sport. “Unknowing to us we have been doing bobsled in Nigeria. In those days there was a fabricated local toy called “Boris” kids use to play with. It is the same thing with bobsled; the only difference is that in other parts it is done on ice. “Many Nigerians will follow in the footsteps of Seun, Ngozi, Simidele and Akuoma. Already we have taken the sport to the schools and introduced it. Besides Nigerians living abroad are also very interested in what we are doing,” Ogba said. Speaking in the same vein, former Nigerian 100m hurdler Adigun added that she was hopeful that what they about to achieve at Pyeongchang will be built upon. “Our aim is to compete and be on the podium. This is platform Nigerians can build on for future games. “We are not doing this because we couldn’t make the America team. We are doing because our parents taught us not forget our Nigerian roots,” Adigun said. Michel Colleau who is general manager, Air France KLM Nigeria and Ghana stated that they were proudly flying the team to the maiden Winter Olympic Games. 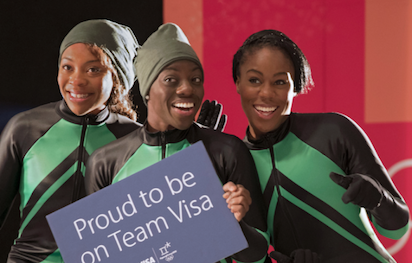 The post Winter Olympics: More Nigerians will embrace Bobsled — Ogba appeared first on Vanguard News.